Most studies of climate change effects on fire regimes assume a gradual reorganization of pyrogeographic patterns and have not considered the potential for transformational changes in the climate-vegetation-fire relationships underlying continental-scale fire regimes. Here, we model current fire activity levels in Australia as a function of mean annual actual evapotranspiration (E) and potential evapotranspiration (E0), as proxies for fuel productivity and fuel drying potential. We distinguish two domains in E, E0 space according to the dominant constraint on fire activity being either fuel productivity (PL-type fire) or fuel dryness (DL-type fire) and show that the affinity to these domains is related to fuel type. 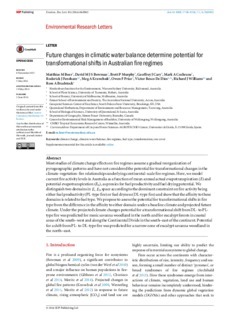 We propose to assess the potential for transformational shifts in fire type from the difference in the affinity to either domain under a baseline climate and projected future climate. Under the projected climate changes potential for a transformational shift from DL- to PL-type fire was predicted for mesic savanna woodland in the north and for eucalypt forests in coastal areas of the south–west and along the Continental Divide in the south-east of the continent. Potential for a shift from PL- to DL-type fire was predicted for a narrow zone of eucalypt savanna woodland in the north-east.